Take a look at my ASP.NET Color Piker. 1. It does not utilize ASP.NET AJAX Framework and AJAX Control/Extender model. 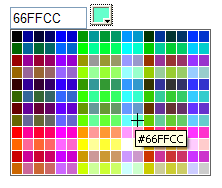 However if you've got ideas and would like to participate in ColorPicker AJAX Extender development please let me know. The ColorPicker extender exposes a "colorSelectionChanged" client-side event that your code can subscribe to. The event is raised after the color is picked in the popup (the corresponding color cell was clicked on). However, I was wondering if you could post a dll compiled against .net 2.0 i've tried it and it's giving me a lot of errors. I solved my problem from my previous post. The controls were losing the data because my target control was set as "ReadOnly"